If you’re looking for a cure-all, fix-all type of face mask, this vaseline and egg white face mask truly is for EVERYTHING! And by everything we mean it will treat acne, random breakouts, dull skin, dry skin, oily skin, aging skin, and even reduce the appearance of acne scars, dark spots, and sun spots. Seriously, if there’s ONE mask you try this week it should be this vaseline and egg white face mask – you won’t be disappointed! Vaseline: protects skin (acts as a barrier), and helps to seal in skin’s moisture. Also helps skin retain water which makes it a great ingredient to fight wrinkles! Vaseline will leave your skin super soft and silky because of its moisturizing properties as well as give it a really beautiful glow. 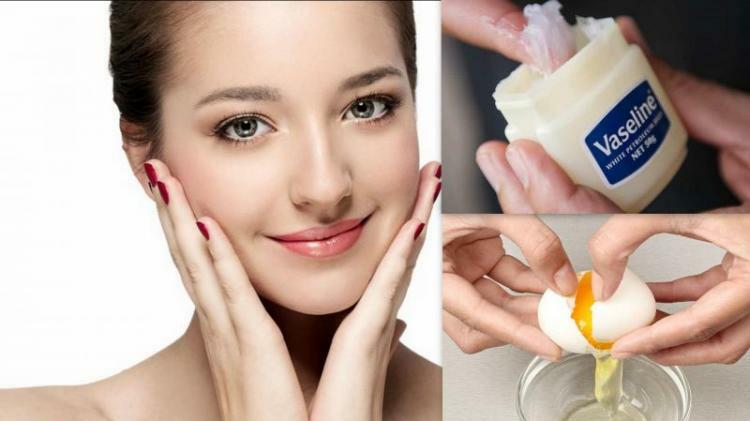 Egg white: packed with protein, egg whites aid in regenerating cells, tightening skin, and purging pores. Makes for the perfect skin cleanser as well! Whip up the egg white just until a little frothy and add the vaseline and a few drops of lemon juice. Apply to a cleansed face and neck and leave on for 15-20 minutes. Rinse off and pat dry. Use 2-3 times a week!